Nowadays, that “pretty legendary” aesthetic is carefully nurtured by the multitalented multihyphenate Radtke herself, a published author, editor, and illustrator. Since coming onboard as The Believer’s Art Director back in 2017, Radtke has managed to strike a thoughtful balance between honoring and doing justice to the legacy of the now-sixteen-year-old mag “while also opening up a space for new voices.” Which is where her carefully assembled ensemble of freelance creatives, such as Alexandra Beguez, Jarett Sitter, Samar ‘Space Vacation’ Haddad, and Gina Wynbrandt come in. 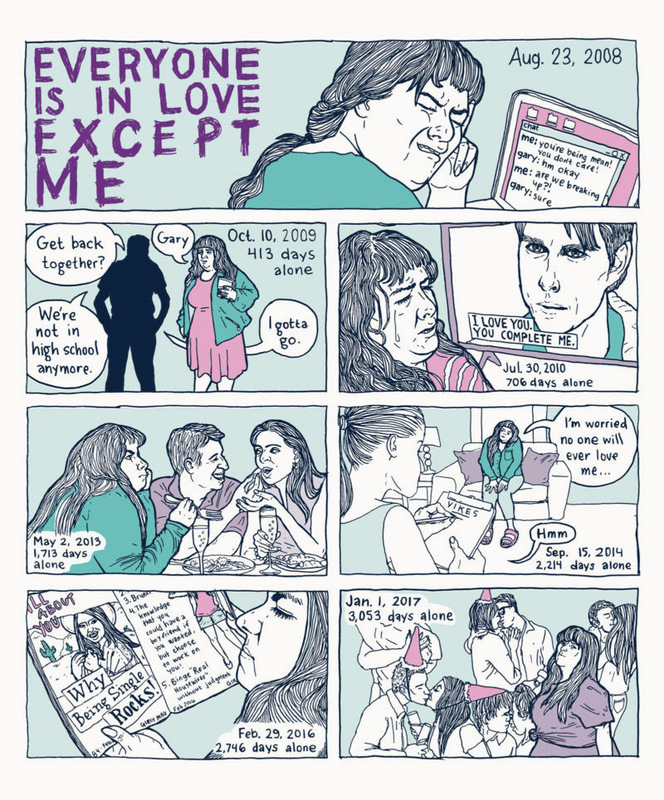 Meanwhile, Radtke had “been wanting to work with Gina Wynbrandt on a comic since [she] came on at The Believer,” adding that her work is “hilarious and excruciating.” The comic Wynbrandt ended up contributing—‘Everyone is in Love Except Me’—was ultimately a complex musing on loneliness, hopelessness, and Elliot Rodger. 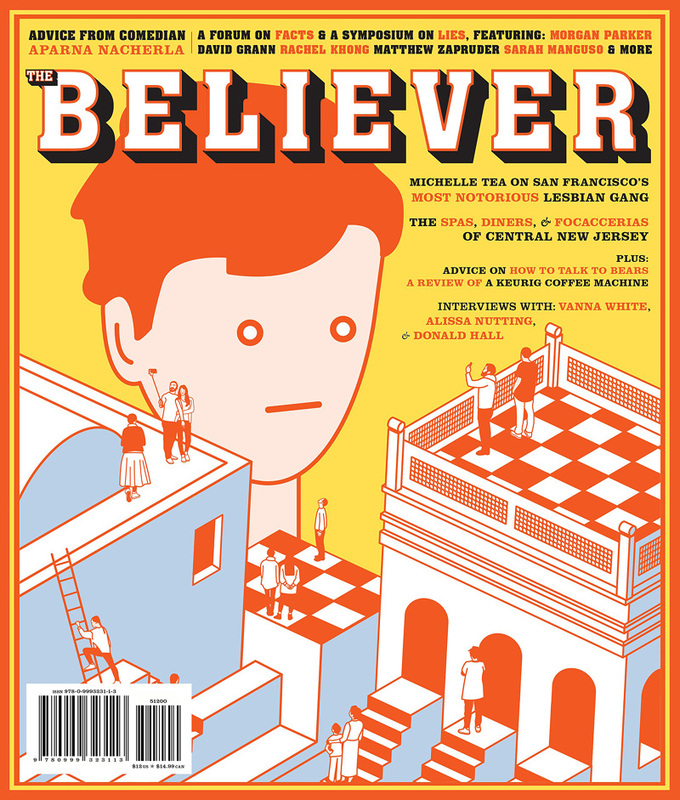 So when a bundle of The Believer mags thudded through my front door a few weeks ago, I was surprised to find myself both eager to dig in and reluctant to sully their untouched beauty. Immediately visually appealing from the outside—the cover illustrations of the copies I received swung between using soothing pastel palettes to looking somewhat like an out-of-this-world arcade game on acid—the tactile matte innards weren’t half bad either; interviews—a staple of The Believer—are headed by illustrated portraits, while expansive, feature-helming double page illustrations left me lingering and luxuriating over each page. Lauren is a freelance travel writer based in Mexico City, who writes about the things she eats, drinks, and reads along the way. Her bylines also include BBC Travel, Lonely Planet, CNN, and Gastro Obscura, among others.